The Moshiqa range of designer dog accessories is now available in Australia exclusively from Fetching Ware. This unique brand of luxury dog and cat accessories was inspired by a little Shih Tzu on the other side of the world. As winter came to Turkey and the cold set in, Moshi would not stop shivering so his mum designed a winter jacket for him. Inspired by her success, she went on to create an entire range of dog harnesses, leashes and collars aimed at the fashion-conscious pet owners around the world and the Moshiqa brand was born. Some of her creations have been spotted on celebrity dogs, like the Bijou Leather Dog Harness worn by Lady Gaga’s pup, Asia Kinney. This wonderfully soft caged leather dog harness features a large double bow and gold signature Moshiqa logo. It is adjustable at the neck and chest and is finished with gold buckle fastenings and D-ring. 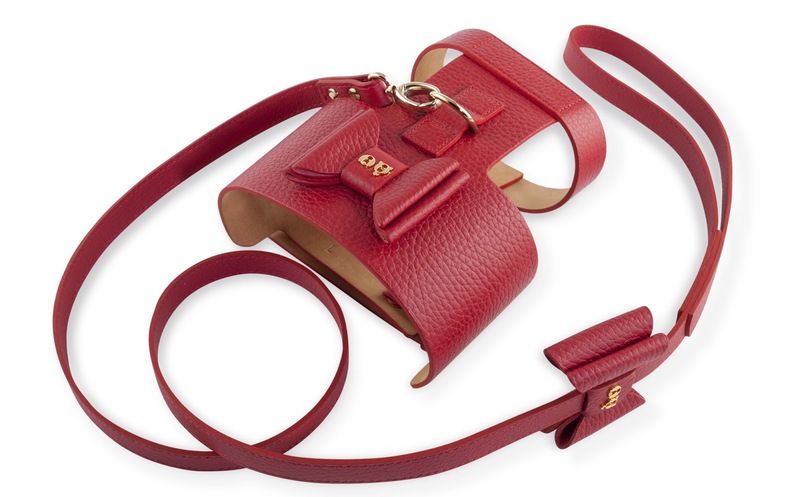 A matching red leather dog lead is available. Your dog will be dressed to impress to accompany you to all your end of year parties! Another one-of-a-kind item you won’t see on another dog is their range of luxurious bathrobes with unique designs for both his and hers! You can now bring the luxury of the spa to your dog at home with these ultra soft bathrobes from Moshiqa made from 60% Bamboo, 40% cotton. The “Best Man” robe comes with luxurious shimmering black edging down the front sides of the robe and along the wrist bands. You can now spoil your furchild on his special day in a sophisticated, stylish robe for over the top comfort to prepare for the big day ahead! There’s also the “Twinkle” design featuring twinkling eyes for the cheeky pup and our favourite “Lady Bug”, complete with ears! Fetching Ware also retails other well-known designer brands of dog accessories such as Hamish McBeth, Hartman & Rose, Laika Hunt, Lisa Welch, Max Bone etc.